Notes: - In my opinion the Dates BC in Wilkinson's plate are too low (of c. 100 years from Naqada IIIB backwards). - Besides I would shift up the indication of 'Dyn 00' to coincide with Naqada IIIA. The origin of the Serekh as a representation of the royal authority of Late Predynastic and Early Dynastic Egyptian kings is an argument which requires a premise of historical character. There is a number of questions of wider range about Late Predynastic Egypt which have not yet found a proper answer. Some of these problems are also connected with the evidence provided by the early "serekhs" and by their possible function and geo-chronological distribution. State-formation in Egypt is a common object of debate; there are some general theories each focussing on different factors or causes and proposing alternative processes and modalities which would have lead to the concretization of the Dynastic State. The way in which a more complex kind of society originated in Egypt could have been either a peaceful (/trade-based one: Trigger, Wildung, Köhler) or rather a conflictual/military one (classical model followed by Kaiser, Helck, von der Way) or perhaps a combination of both (and of further interacting factors; Hoffman, Kemp, Bard). The archaeological data and their interpretations have undergone an outstanding renewal in the last twenty years. Yet they remain more or less unbalanced. For example the Late Predynastic (L.P.) and Early Dynastic (E.D.) period in the Delta was very poorly known before the beginning of excavation campaigns in the 1980s and the publications of E.C.M. van den Brink edited volumes of 1988, 1992 on Nile Delta. Now we have a good quantity and quality of data for that region, from both cemeteries and settlements; this contrasts with the documentation from Upper Egypt and Nubia which, for the same period, is (owing to different reasons) mainly deriving from funerary contexts, with the important exceptions of isolated finds at Koptos, Naqada, Armant, desert widians (rock graffiti) and, especially, the more substantial and recently excavated contexts at Hierakonpolis, Adaima and at Elephantine (E.D.). Furthermore, contrarily to what can be said for some southern cemeteries, namely those of Abydos (U, B), Hierakonpolis (Loc. 6, Loc. 33 tomb 100) or Qustul L, Seyala 137, which have been convincingly demonstrated as belonging to the local or regional chiefs, no similar proposal or conclusion has been drawn, to my knowledge, for any Lower Egyptian (L.E.) cemetery or tomb (also those which yielded royal insignia like pottery incised/painted serekhs) of Naqada IIC-IIIC1 (c. 3500-3000BC). There are indeed some indications which seem to suggest that there could have existed independent regions or at least localities up to the very end of Dynasty 0; these conclusions are generally based on the occurrence of royal names (as Horus Crocodile, Scorpion II and others) which haven't been (yet) recovered in the Abydos L.P. cemeteries. But as we have seen, in L.E. during Naqada IIIA-B we don't know any cemetery which may be certainly attributed to local polities' rulers: this heavily influences our opinion about Abydos: the absence of the mentioned evidence leads us to believe that the Thinite could have already been at that time the leaders of the whole Egyptian Nile Valley. But this is far from being an ascertained fact, although remaining a concrete possibility. The 'political' situation of early Naqada III L.E. and Delta is, therefore, still a partial riddle. All these factors must be taken into account, for they risk to bias our view of the processes developed during Naqada III. One of the central points here, is just the role of the Abydos élite before Naqada IIIC - beginning of Dynasty 1 (circa 3060 BC): should the enormous amount of gravegoods and imported Palestinese wine-jars found in Scorpion's tomb U-j at Abydos be interpreted as a clue that this king already reigned all over Egypt (in Naqada IIIA1/a2, i.e. 200±50 years before Narmer), or can we only assume he had overwhelmed the other regional polities of the Qena bend area (such as Naqada: cf. the Gebel Tjawty panel)? Surely long distance trade with Southern Levant (espec. luxury goods as wine, oil, cedar wood, resins) was already very important for Upper and Lower Egyptian societies at that time (and even before: e.g. Maadi, Buto). But we are not impelled to presuppose a U.E. monopoly for that, and not even a colonization of Near Eastern centres; this latter circumstance seems to have only occurred late in Dynasty 0 up to the first half of Dynasty 1. Probably the Thinites initially availed of trade intermediaries: in the case of the Southern Levant route, these middlemen must have been the North Egyptians, whose culture -up to early Naqada II- still differed from the Southerners' "Naqadian" one. We don't know when did these relations (if any) cease and whether did the Thinites exploit an alternative trade-route via the Wadi Hammamat and Red Sea as it's been also proposed. In Naqada IIIA-B, there is no trace of any royal name (before *Iry-Hor and especially Ka and Narmer) which has been identified in distant spots of the Nile Valley: the exception is king (?) "Double Falcon", known from U.E. [Adaima, Abydos(?)] to N. Sinai and S. Palestine. But it has not been demonstrated that this serekh (cf. the different variants in, van den Brink, Archéo-Nil 11, 2001) is a personalized one, thus identifying a precise early Naqada IIIB ruler's name. 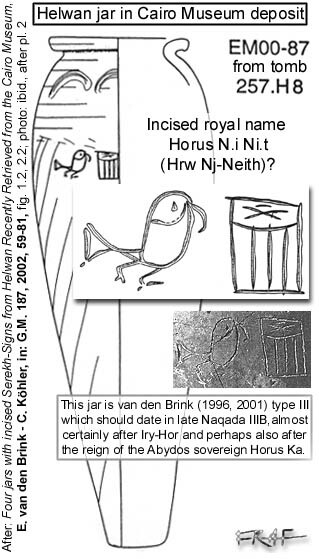 Stan Hendrickx has expressed his perplexities about the actual value as a personal royal name of all the plain, anonymous and even some apparently 'personalized' serekhs pre-dating those of late Naqada IIIB (ab Horus Ka). This period was an age of transition, equally or even more than the Early Dynastic was. We can follow the evolution of determined 'patterns' which led to incredible achievements of the late Dynasty 0, in turn brilliantly pursued in the dynastic times. On the other hand, a number of other paths (which however make up an equally significant part of L.P. archaeological data characters) were abandoned and did not survive to the rapid changes and turmoiled centuries of the political unification and/or to the radical re-canonization and new organization of the First Dynasty state. To adequately follow the growth of the pre- and early- dynastic civilization, we should analyze both the differences/breaks between them and the elements of continuity/evolution; every single feature of the material culture we are facing with must be properly studied: the evident character that manufacts, their attributes and other products express (primary use, style and typology, technology and material used, diffusion) but also their more hidden or concealed aspects (ideology and symbolic value, eventual hidden purpose and 'esoteric' meaning). The early royal name is one of these patterns of which we can analyze the structure (graphic compound form), meaning, diffusion and historical evolution, in order to attempt to isolate relevant data not only for the specifical matter but, as we'll see, for wider range objectives too. The Serekh (henceforth s.) is a roughly rectangular stylized representation of a niched-façade building (or part thereof). The top of the s. can be both plain or rounded concave and a falcon can be perched on it . Inside, the proper s. is generally divided in an upper part, which can be occupied by the royal name, and a lower part which is framed by the vertical lines representing the palace façade niches, slits or bastions. There can be many variants to this general formula: plain serekhs (P.), as defined by E. van den Brink, are composed of the palace façade frame only, while anonymous (A.) serekhs display both the niched façade and the name compartment above it, but this latter is left empty. The falcon is frequently omitted and, in a very few instances, it is represented beside, rather than atop of the s.
There can be P. or A. serekhs with two falcons (in almost all the cases facing at each other) which are, with some doubt, thought to represent an individual king's name, Double Falcon. In some cases, Horus Ka's name appears in the lower part of the s., while the top of this latter has the niched design or an AH- palace looking motif (cf. n. 2; also J. Kahl, Das System..., 1994, 38ff.). Some royal names could be referred to as 'serekhs' even though they are not written within the serekh, as Pe-Hor and Iry-Hor (which consist of a falcon with its legs on a monogram, P and R respectively) or some examples of Narmer's name. Early kings' names could be written with only a monogram (Scorpion), or there can be a star or "Rosette" which is thought to be another indicator of royal name (as in Scorpion II's name; cf. bibl. in n. 10). In the classical royal titulary, the s. is the first of the five titles, representing the so called Horus name (or Ka-name). It is generally assumed that the Falcon is the archaic sky-god Horus (cf. n. 2) who protects the king and his residence; most of the scholars believe that s. represent the royal palace, but there are some exceptions (royal tomb, funerary enclosure, false door). In any case we can consider it as a powerful graphical metonymy of conceded authority (n. 5): a numinous or divine being, of which the falcon is a hypostasis, rests and watches over the residence of the reigning monarch, which is a very direct symbol; the palace, from where the king commands, is a sort of micro-cosm of the whole state territory, which the king rules just "in the name of the god", under the god's protection and for god's will and delegation. It is not a case that the king-name, which labels the serekh-palace, is written below the falcon, with evident implications about the nature of the early divine kingship. The Egyptian word for "srkh" is only later attested and its meanings are generally based on the terms which indicate: a banner for the Horus-name, a throne, a palace façade, a memorial (stela); alternatively the word etymology has been related to the causative of the verb rekh, (srkh, 'cause to know', 'to display', 'to learn about'). The Horus name written with(-in) the s., was the official name of the Dynasty 0-3 sovereigns, with rare exceptions ; from Snofru onward the cartouche name became the main and most frequently used one (attached to the Nswt-bity 'prenomen' and to the Sa-Ra name) so that the Horus name knew a more restricted use and it is in fact far less frequently encountered (alone) in the inscriptions. Obviously, apart from the philological alternatives, any of these interpretations does also imply a different underlying conception of kingship, of king's divinity and of king's (and falcon's) significance, status and essence. It is not impossible besides, that the Egyptians acknowledged the s. more than one of the proposed functions and interpretations at one time; in their mentality in fact, the exclusion principle did not necessarily always apply: an apparent contradiction of terms - according to our own way of reasoning and conceiving reality - could instead fairly subsist in their conceptions, and also constitute a fruitful enrichment and accumulation of symbols into the 'hieroglyphic-logo' designated to shelter and display the kings' names [6b]. 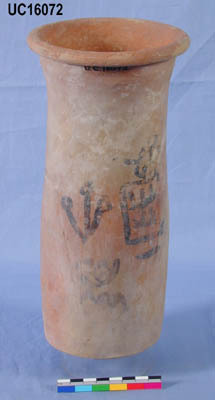 Most of the known Late Predynastic serekhs are incised on tall wine jars found in Egypt (and Southern Levant); the incision was made with a pointed (probably bone or ivory-) tool in the wet clay of the vessel's shoulder, and sometimes an additional mark was incised beside the s. (possibly these are connected with the 1st Dyn. pot-marks and might have been properties indicators). Much more rarely s. are found to have been scratched on the pots after these had been baked (post-firing incisions; Table 1: pfi). On cylinder jars the s. were painted with dark ink (by a 2-4mm thick brush), the royal name hieroglyphs were more cursive and accompanied by the indication of the Upper or Lower Egyptian tax (respectively jp Shema, Hn/nHb MeHw). The earliest known seal impressions with clear royal name are from Iry-Hor's reign (Abydos and Zawiyet el Aryan) but there are older examples which might perhaps have born high status individuals' names we cannot yet interpret as such. S. also appear carved on various types of artefacts, thus objects which are not directly related to the economic / administrative subsystem: these must be rather conceived for kingship propaganda (powerfacts), being luxury ceremonial manufacts full of symbolic meanings (Metropolitan Museum palette, ivory knife handles, A-group incense burners). 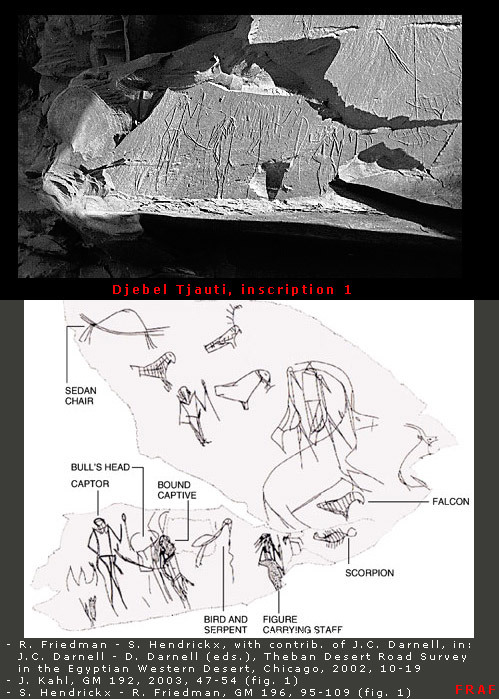 In Upper Egypt and Lower Nubia there are sporadic traces of Late Predynastic graffiti with P., A. and personalized s.: the prototype is probably the Gebel Tjauty tableau, with a scorpion below a falcon related to a complex scene(cf. infra), then a small number of anonymous s. in the western and eastern deserts (reported to have been incised alone, i.e. not being part of a representation or inscription) and the Gebel Sheikh Suleiman one (on the left of a scene showing the aftermath of a fluvial battle) which is apparently plain and surmounted by a falcon. 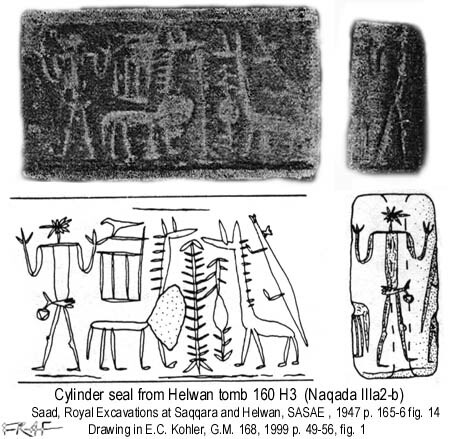 The origin of the graphical compound which constitutes the s. is rather obscure: it can be hypothesised that the prime inspiration for this symbol were the Elamite and Mesopotamic temples which were represented on cylinder seals as early as the middle of the IVth Millennium BC (Susa II-III and Uruk V-IVC corresponding to Palestine EB Ia, U.E. Naqada IIC-D and L.E. Buto II). The same inspiration must have influenced the much later architectural palace-façades observed in early Naqada IIIC1 (c. 3000 BC) tombs and mudbrick enclosures (at Naqada, Abydos Kom es-Sultan and North Saqqara early in the reign of Hor Aha). However, already during early Naqada III (A-B) there were in Egypt artefacts and administrative objects (as decorated knife handles, palettes, vessels, tags and seals) portraying shrines and royal palaces with architectural parts recalling the serekh device. Shortly later, shrines and plain s. also occur on Lower Nubia A-Group artefacts (incense burners, seals and painted vases). It should however be made a distinction between true serekhs and representations of shrines: although, as we have explained, the latter could have been at the origin of the former one, we can generally understand the proper function and symbolic value of the two categories, which is often a somewhat different one. Moreover it is very hard to establish the secure origin of a motif like the s., which might have embodied already since its origin a multitude of influences, meanings and functions. Pot-marks in the shape of crude plain serekhs are found on Lower Egyptian tradition pottery (late Maadi, Buto I-II, Naqada IIBC) which should be the oldest examples known to date (post firing incised ?) (T. Von Der Way 1993; A. Jiménez 2002). At Ezbet et-Tell (Southern Palestine) early anonymous serekhs seem to date as early as late Naqada IIIa2 or early IIIb1. 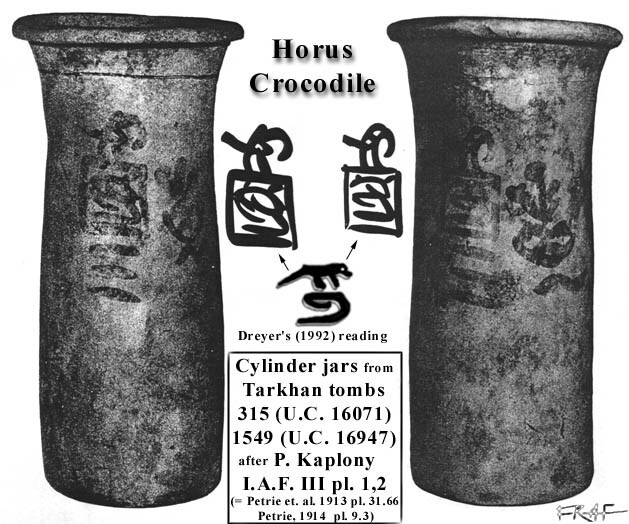 In Upper Egypt the earliest certain royal name is that of Scorpion (the renowned owner of Abydos tomb U-j, born around 3330/3250 BCE) whose name is written in ink on jars (and incised on few bone tags). In some of the ink attestations it's formed by the scorpion standing on a flat rectangular sign with inner vertical and horizontal crosshatched lines, perhaps a further example of proto-serekh or a 'topological' (district?) hieroglyph (cf. the same sign painted on cylinder jars from tomb U-s: Dreyer, Umm el-Qaab I, pl. 59b-c). Further hieroglyphic signs from the same context have been compared with royal names or even early s. (see pt. 2.3). 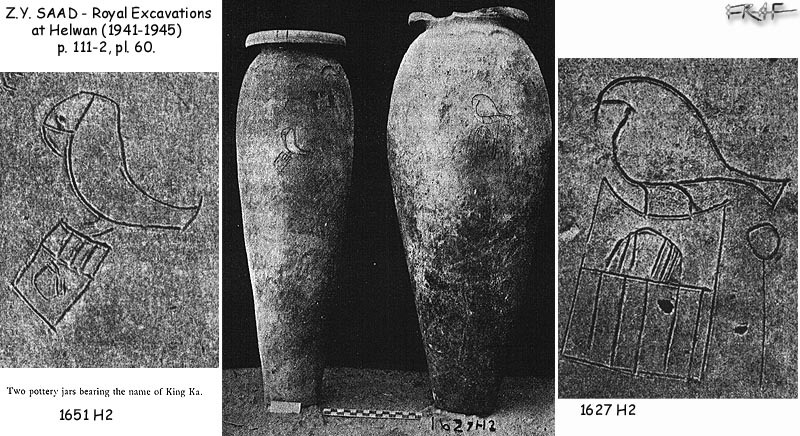 Some decades later (early Naqada IIIB) in some of the latest predynastic tomb of the Abydos cemetery U (U-t, U-s) ink inscribed anonymous s. are found on cylinder net-painted jars. It has been advanced that the s. was originally a symbol/mark of royal ownership, i.e. signalising that the commodity on which container it was incised or painted did belong to the local or regional chief (see pt. 3 below). As I have premised, royal names and s. are known from different periods and places. Plain serekhs are more widespread, for they've been found in many more sites and even earlier/later than Naqada IIIB. They've been also reported (and published) in many Southern Levant sites (where, apart from few anonym. 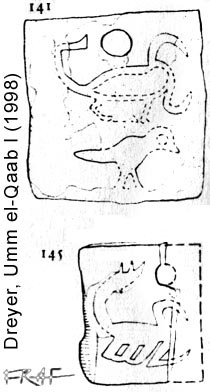 serekhs and one possibly of Double Falcon, the personalized ones start to abound only since late Naqada IIIB and early IIIC, the period of "Egyptian colonisation" of EB Palestine centres; for this period specimen, the finds mostly derive from modern excavations, and they are therefore better published, i.e. exact provenance and associated finds have been recorded). T. von der Way and others have dated plain serekhs from Maadi and Buto (fragmentary jars potmarks) as early as Naqada IIB-C. This coincides with the first period (around 3500 BC) in which Egyptian artifacts show influences of Mesopotamic (Uruk V-IV) and Elamite (Susa II-III) glyptic motifs (another period of heavy N.E. influx seems to have been late Naqada IIIB/ late 'Dynasty 0'). The nature of Egypt-Syro/Palestine interactions during EBI(A-B) is not yet precisely defined. Material finds [a wide range of Egyptian objects types found in Canaanites sites and Palestinese jar types known in some Egyptian (Late) Predynastic sites] demonstrate that non occasional trade relations already existed at least since the beginning of the second half of the Fourth Millennium. But it is hard to establish when did this relation mutated into a form of Egyptian colonialism. Andelkovic (1995) believes that this occurred in the c. 2 centuries of EB IA (Naqada IIIa-b). In this period, Egypt consisted of few proto-states or already one early state, whereas Southern Levant centers were still in the proto-urban phase and therefore at a 'lower step' of society in terms of cultural evolution (chiefdoms, rural communities and small-medium sized villages). Thus there was no competition possible, Egyptians being far superior in their organization; there is indeed inconsistent indication for struggles and the known fortifications (like at Tell Erani) were plausibly meant to defend (both the indigenous people and the Egyptians colonists) against incursions of local marauders' bands. The most important material which Egypt imported from Levant was the Lebanese cedar wood which was needed in civil and funerary architectures infrastructures and furniture, whereas the main imported product was certainly wine. If we exclude the cited king (?) Double Falcon, it is only at Abydos that we find a variety of early examples. There are early Naqada IIIB(IIIb1) anonymous serekhs from cem. U (ink-drawn on net-painted cylinder jars). Earlier sources (esp. tomb U-j, Naqada IIIA1/IIIa2) haven't yielded any trace of this royal-name device: a possible exception is the palace façade bird-topped shrine carved on some bone labels from tomb U-j: (upper row): as I have said above, this is interpreted as a toponym, which is very likely, and it could relate to "Djebawt" (Buto) in Dreyer's opinion (contra A. Jimenez Serrano: he proposes it, as well as the temple represented on Narmer's macehead, should rather refer to the Nekhen temple -within the town of Hierakonpolis-). 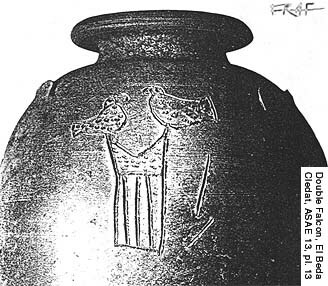 A serekh-like motif is known scratched on a Black topped ware from Naqada (Ic) t. 1546 where a (ibis?) bird is perching on a tall convex-topped structure (?) (W.M.F. Petrie, Naqada..., pl. 51.28; E. Baumgartel, in: JEA 61, 1975, 31, pl. X.2; J. Kahl, Das System..., 1994, 157, 159, n.88; J. Crowfoot-Payne, Catalogue..., 1993, 40, fig. 25.174 = Ashmolean Mus. cat. n. 1895.324). 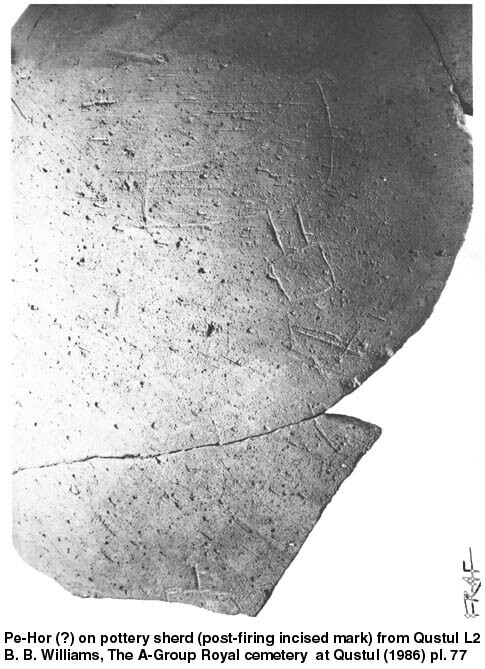 The late Barbara Adams has interpreted as a possible proto-serekh (of plain type) a sherd of white cross-lined pottery found among later (Naqada III) ceramics in the Area 1 of the Hierakonpolis cemetery at Locality 6 (B. Adams, in: CCdE 3/4, 2002, 8, 25, fig. 5); in this case it is very difficult to somehow relate the small Naqada I squarish drawing (depicted within vertical dotted lines) to the later s. of Naqada III. The palace-façade shrines represented on Naqada III palettes and knife handles are mostly unprovenanced (however see the recent Abydos finds published by Dreyer, the new Hierakonpolis knife handle restored at Oxford: H. Whitehouse, MDAIK 58, 2002 with full bibliography). Plate 2 (nr. 12, 18, 23a-b) illustrates falcon topped s. found on Lower Nubian Terminal A-group carved artefacts. The nature of these objects and their representations, as well as the peaceful (trade) and violent relations between Egypt and Lower Nubia have been summarised in my page and article on Dynasty 0. 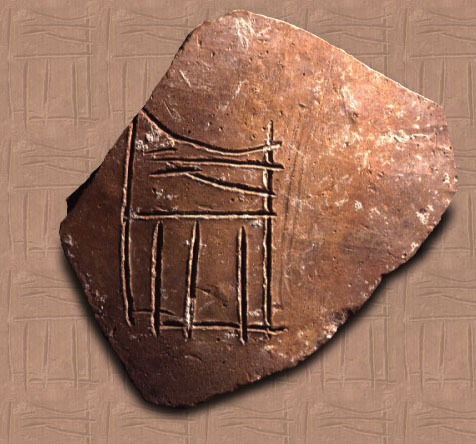 The German team directed by G. Dreyer has excavated some bone tags with incised signs (among the earliest hieroglyphs currently known), on a number of which a bird topped serekh-like building is shown: this is actually much similar to a falcon-topped plain serekh, yet it is likely to represent a toponym for the settlement of Buto (see above for a different interpretation). 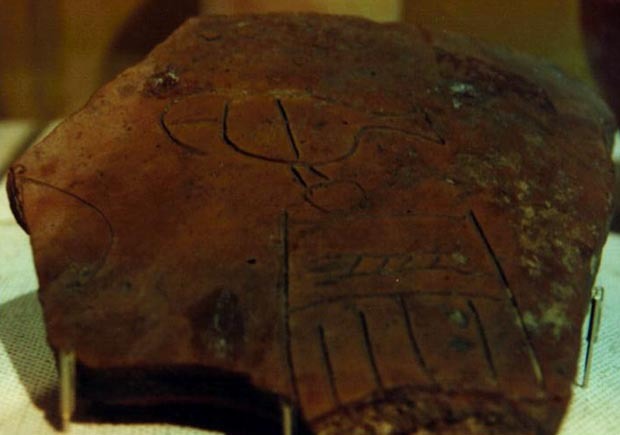 The vaulted shrine carved on the Hunters palette has been proposed (by J. Cervelló Autuori, in: Aula Orientalia 13, 1995) as an origin or a precursor of the serekh motif. Similarly -as I have premised above- buildings and structures depicted and carved on other objects should be considered possible s. precursors [for a more detailed list and description see my article Dynasty 0, quoted in n. 9, and its shorter/older web version]: yet we don't know if the shrines carved on early Naqada III pieces have to be related to the Near Eastern motifs influence or, instead, it was a fully Egyptian achievement based on imitation of contemporary indigenous wickerwork 'architectures'. 1) Contrarily to the so called "commemorative" documents (decorated artefacts destined to tombs or temples such as palettes, maceheads, knife-handles, vessels and some desert graffiti) which are nearly univocally interpreted as embodying symbolical and ritual significance and intents, rock graffiti of the mentioned genre are universally acknowledged as a kind of historical reportages (the same has always been for the Lower Nubian graffito of Gebel Sheikh Suleiman). 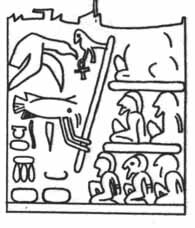 2) Some elements of this Scorpion's tableau could be useful to comprehend parallel proto-hieroglyphs attested on decorated ivories. (For this latter specifical trait see the discussion I have dedicated to the argument in the Dynasty "00"/Scorpion I section). 3) This point could be connected with the argument of the present paper: among the possible proto-hieroglyphs which can be found on the Scorpion graffito, two of them seem to cover the role of indicator of personal names of the scene protagonists: the defeated captive seems to be labelled with a bucranium set on a pole (this could also represent the territory were the captive came from; Dreyer has proposed that a Bucranium on pole, written in ink on some jars from t. U-j, should be read as a royal name); before the procession (closed by the victorious king himself) an interesting pair of clearly incised hieroglyphs is constituted by a scorpion below a falcon. If both these signs really refer to the named ruler, and to himself only, we would have here the first certain attestation of a king's name paired with the Falcon God (Hrw? ), this latter already having a title-like function. 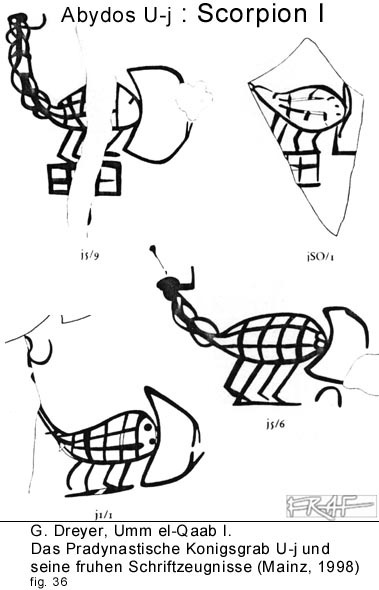 Comparable pair of hieroglyphs are incised on some of the small tags from tomb U-j, whereas on jars ink inscriptions the hieroglyph of the scorpion occurs alone or with a rectangular sign (similar to later district-signs such as spt or she; cf. above at the end of part 2.1). The canonized and definitive version of the s. only appeared late in Naqada IIIB/Dynasty 0 (Horus Ka/Sekhen). Even during the Dynastic period there were different graphical variations of s.: e.g. the falcon could wear different crowns, it was substituted by Seth/Ash during Peribsen's reign and by the divine pair Horus & Seth during Khasekhemwy's one, late in the Second Dynasty. In the early- First Dynasty the falcon tends to lose its roughly horizontal posture in favour of a more oblique one; by the same period (Aha, Djer) the concavity of the upper part of the s. is dismissed and the upper line is always drawn straight. Other variants (see the list below or the plate 2 above) were the painted s. of Crocodile from Tarkhan (no palace façade; also cf. 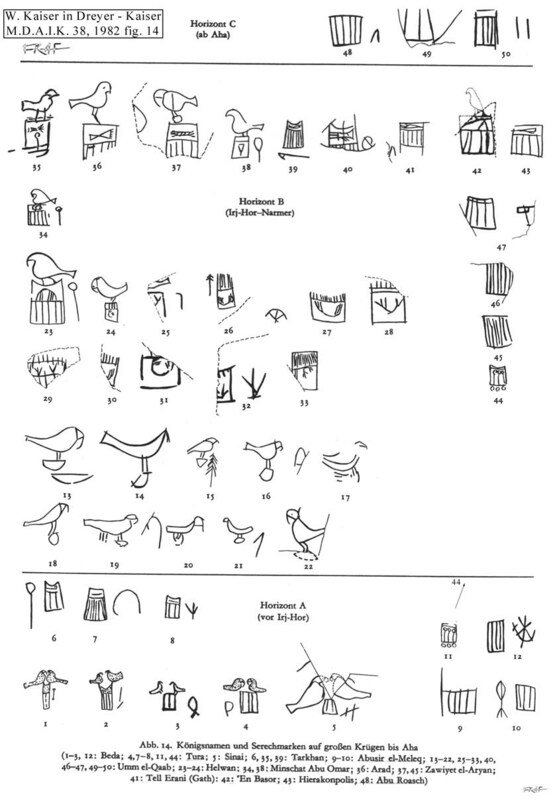 note 2), those of Nj-Neith (lateral falcon), *Hedjw-Hor (palace façade is substituted with three mace-like objects), Iry-Hor (no serekh) and more (e.g. 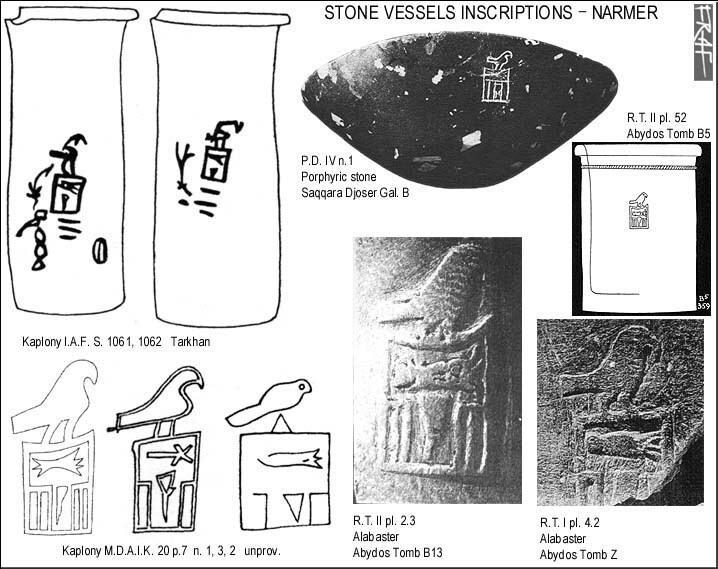 the many forms in which Narmer's name is attested). All these differences are comprehensible, and not only in geographical terms, because the standard of the royal name compound was not yet fixed and did not conform to a single form before the end of Naqada IIIB/early IIIC. 1) King Scorpion (II) belonged to the Thinite Dynasty 0, and he must have been buried at Abydos cemetery B in a tomb which has not yet been located (or in tomb B50, few meters south of Umm el-Qaab O) as G. Dreyer supposed. Thus the adoption of a different title must have depended on the fact that the designation of royal name 'protocol' in the written documents was not yet fully developed at that time. In support of this theory we could consider a short list-like inscription on a tile from the early temple of Abydos: beside a long nsw (sw) hieroglyph (sovereign) are roughly and vertically incised the hieroglyphs Ka, Scorpion (Srq ?) and R (no serekh) which A. Jiménez-Serrano interprets as a likely rude indication of the late Dynasty 0 rulers' succession [A. Jiménez- Serrano, Los reyes del Predinàstico tardìo (Naqada III), in: BAEDE 10, 2000, 33-52; W.M.F. Petrie, Abydos II, pl. VIII.205]. 2) W. Kaiser, M. Hoffman and others thought that Scorpion originated from a different ruling line of a different region than the Thinite nome, likely from Hierakonpolis (in M. Hoffman's opinion his tomb could perhaps have been nr. 1 of the cemetery at Locality 6). In the southernmost Egyptian regional polity (capital Nekhen), the rulers would perhaps be designated by a rosette or star: this could also explain the diffusion of this symbol in Lower Nubia (Qustul cem. L), which surely shared a durable trade partnership with Hierakonpolis. There is no doubt, but it is important to remark this fact, that the formal evolution of the monarchs' name-designation is not only a matter of mutating aesthetics' canons and ongoing elaboration of the laws of decorum: these systems were influenced and guided by parallel developments in other spheres of the Egyptian civilization, namely society, administration, politics and especially monarchy and religion. Beside these factors, regional traditions and foreign influences (presumably with variable impact onto different areas) could have had an additional, if not decisive role in shaping initially divergent configurations of the paramount leadership and its aspects of display. Anyway, early in Naqada III, the slight discrepancies in these and in other features of the Egyptian reigns traditions, must be considered already well advanced on their way towards the uniformation. This process ("cultural unification") was favoured by the Gerzean chiefdoms' tendency to the 'mobility', which first caused the "Upper Egyptian way of life" to spread all over the Lower Nile Valley (before the end of Naqada II) and then, perhaps after multiple episodes of war and warfare in various areas, brought a few polities ('proto-states') to accomplish the final step for the creation of a unique 'national' entity (during Naqada IIIA1-C1). Despite the fact that this age is currently attracting many researchers and excavation campaigns, which is contributing to unveil more and more secrets of LP history and culture, it still remains difficult to fully comprehend it. New and multi-varied perspectives of study will certainly help the better understanding of many aspects of this sector of Egyptology, but field-work and discoveries do remain the former source for improvements and progresses in our study and knowledge. For instance, it can be hard to positively date a certain ruler whose attestations are only a few ones; but sometimes the form of the s. or details thereof can help us to compare and establish parallels on palaeographic bases. Van den Brink (2001) has reasonably argued for the possibility to attribute certain falcons of incised s. on pottery fragments to the same artisan "hand". This analysis, as well as that of the object (style, typology and material) on which the s. is found, is often of fundamental importance for archaeological, chronological and historical purposes. 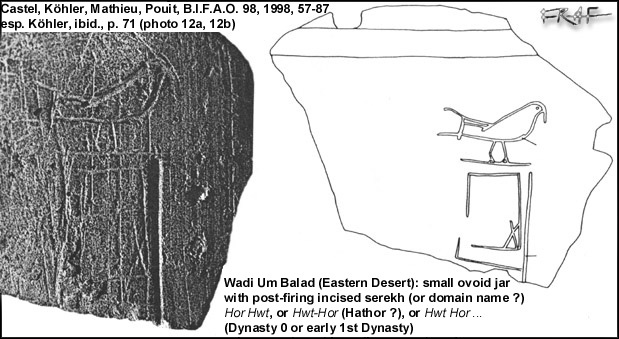 In my opinion it could be possible to isolate regional styles in the decorations of late Naqada II- early Naqada III palettes, knife handles and other objects, in the same way as E. Finkenstaed (see note 13) has attempted to do for Naqada I and II painted pottery (Petrie's C and D ware). The obstacles are obviously in that most of these artefacts are of unknown provenance and limited number; and, for the provenanced ones, there is always the possibility that they were object of trade or gift in the antiquity. It is in Upper Egypt that the architectural motifs (which are thought by some scholars to lie behind the serekhs stylised representations) are presently known from earlier contexts: 1) Niche-like slits in tomb U-j chambers (similar to false doors between the various rooms of the model royal-palace which the tombs seems to imitate). 2) Naqada mastaba of Neithhotep (but this already dates early Naqada IIIC). The important evidence of a bastioned palace- (?) gateway in the settlement of Hierakonpolis (K. Weeks, in: JARCE 9, 1971, 29ff.) is generally considered, not doubtlessly, of late Second Dynasty date (reign of Khasekhemwy). However no similar early architectural feature is presently known from LE and Delta before the First Dynasty: the evidence of possible façade decorations at Buto, which would have consisted of clay cones ("Tonstifte" and "Grubenkopfnagel") applied to the external walls like in the examples known from Mesopotamia, has revealed misleading because the functional character of these pots has been clarified (bread moulds, beer and salt production tools). The mudbrick niched mastabas of the Memphite area date from Aha's reign, and those of Minshat Abu Omar are even later (Den). Now, some authors have postulated that the (plain) serekh might have originated in Lower Egypt: A. Jimenez Serrano, basing on von der Way and on the finds from Maadi and Buto, has hypothesised that the iconographic device could witness the emergence of L.E. culture élites in mid-late Naqada II (GM 183, 2001). Van den Brink (ibid.) has challenged some of the presuppositions Jimenez has availed of, yet seemingly joining on a theoretical, hypothetical level, the general idea of a possible origin of the serekh (and niched architecture) in Lower Egypt (influenced by the Near Eastern decorative motifs). He also notes that evidence from jar-inscriptions is very dangerous to base on, for jars can be and are usually traded, even along large distances. S. Hendrickx points to a more probable independent origin of palace façade and serekh motifs in Upper Egypt (GM 184, 2001). 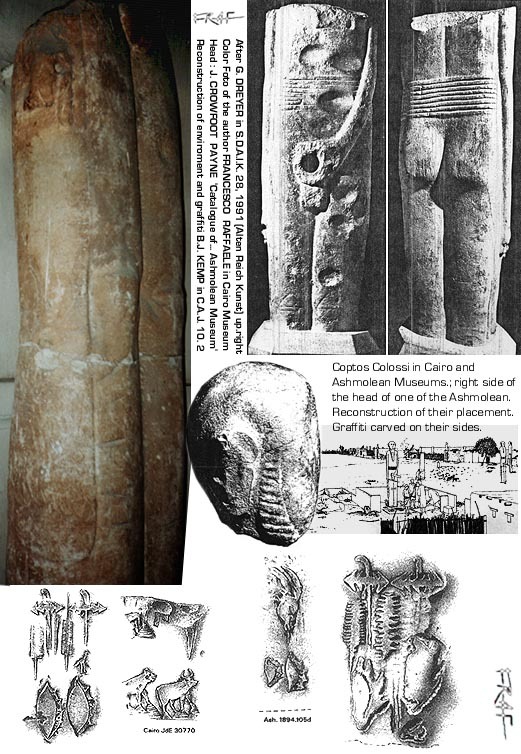 He also believes that the three main types of serekhs (anonymous, plain, personalized) might have had themselves a different (chronologically and geographically) origin and evolution and that, the anonymous ones of Abydos southern cemetery U (in ink on cylindrical net painted jars) predate the plain ones. It is not certain that the complex niched architecture was the base or inspiration for the serekh representation: maybe the latter imitated lighter materials buildings and the palace façade derived from a later Near Eastern influence of Early 1st Dyn. date. Moreover Hendrickx states that, apart from the jar type on which the serekhs appear (which can be a chronological indicator, cf. vdBrink 1996, 2001), another important diagnostic feature can be the same kind of inscription: pre-firing incised or painted (post firing incised are quite rarer). As also the other authors have noticed, the geographical distribution of the serekhs (for which cf. Jimenez Serrano, Archéo-Nil 12, in press) may not be a fully reliable indicator of the presence of a local power nearby the findspot (cf. van den Brink above). Finally, even more important, Hendrickx underlines the possible antecedent of the serekhs in the UE architectural structures (both in light materials and in mudbrick) at least as early as 3300BC (mentioned slits in tomb U-j chambers). This opens another problem: the origin of the wine jars on which serekhs are inscribed (originally probable indicators of royal property). It can be thought that pottery was occasionally or regularly manufactured elsewhere from where it was finally found. I think that this problem could be solved with a deep analysis of documents (materials, palaeography and, more limitately -for the inscriptions are usually short- epigraphy). [Cf. similarly the stone vessels with incised inscriptions from Djoser's complex]. 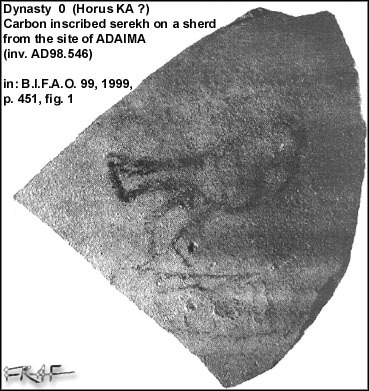 Some of the known pottery incised serekhs must have been drawn in Canaanite centers. The problem about relationship between architectural palace façade and representational one (serekh) is that the earliest evidence for the former one are actually much more recent than the latter; besides, the serekh, except perhaps those from Maadi, are always assumed to have been attached to chiefs' or kings' ownership, while the very first niched architecture presently known (Naqada IIIC1) is not directly related to the kings, rather to their wives or courtiers. Certainly, it is to be assumed that the mudbrick niched architecture has (1) a longer history extending back in L.P. period and (2) an original urban destination (temples or chiefs' residences) in lighter materials (3). This doesn't imply that a prime Near Eastern influence should be dismissed at all as the origin of the architectural (and iconographic) motifs: but this influx might have occurred independently, in different stages and modalities for U.E. and Delta. (3) is evidenced by the structure of the buildings figured on Naqada IIC-IIIB sealings, carved ivories and other objects. E. van den Brink's (1996, 2001) studies on pottery incised serekhs (and 1992; in press, on 'potmarks') are fundamental for a more precise chronological arrangement of the serekhs depending on the wine jar types on which they are incised. However there are some (minor) problems with the datation of both some early types (I-II) as well as later ones (III-IVa): e.g. some types seem to have overlapped with each others and other ones could/must have had longer life-spans than supposed. It is hoped that the corpus will continue to increase as well as that of cylindrical vessels with ink inscriptions. Incised serekhs are often associated with further marks (similar to later 1st dyn. potmarks or true hieroglyphs) which should specify the origin or destination of the commodity contained in the jar. Cylindrical vessels (esp. from Iry-Hor to early/mid. 1st Dyn.) are associated with the indication of the U.E. or L.E. tax (cf. above). Thus these latter, despite the different use, must also be considered beside the other type pottery corpus. To summarise to this point, the serekhs corpora are certainly one of the main elements to be investigated in order to form better ideas on chronological, political (kings' names and area of influence, state formation process) and economical/administrative (trade organization, centres of production, of delivery, redistribution) matters. In general, the problem of the serekhs on jars is tightly related to that of the area of influence of Naqada IIIA-early IIIB rulers, which is still open to debate in lack of further evidence (from other sites and on different supports). Perhaps Abydos was only one of the late Naqada II/early III proto-states of Egypt. The DAIK discoveries there, have lead some scholars to suppose (on the basis of the massive evidence from tomb U-j) that king Scorpion (I) did already reign on the whole Egyptian Nile Valley around 3250BC. This recalls me of the (speculative) somewhat hazardous statements that another great Egyptologist, B. Williams, attempted when he published the material from the early 1960s K.Seele's excavations of the (Terminal A-group/ Naqada IIIa2-b2) Lower Nubian cemetery of Qustul L.
Indeed we actually don't know how many more royal tombs lie not yet unearthed at Abydos itself. The same number of kings of the so called "Dynasty 0" is unknown. Dreyer's theory of royal names carved on the Koptos colossi and other monuments/objects, has been recently criticised  and the same attribution of the name "Scorpion" (I) to the ruler buried in Abydos tomb U-j is far from being undisputable. Right or wrong as these theories may be, we are still lacking a limpid picture of the number of sovereigns (and of eventual parallel ruling lines) involved in the long process of Unification during Naqada III and we ignore the exact way in which this process was carried out (and the part that Abydos, Hierakonpolis and other polities played in this). Trade between LE and "Canaanites" existed from late Palaeolithic and espec. Chalcolithic, but it was in Early Bronze IA-B (Naqada IIc-IIIb2, Mesopot. 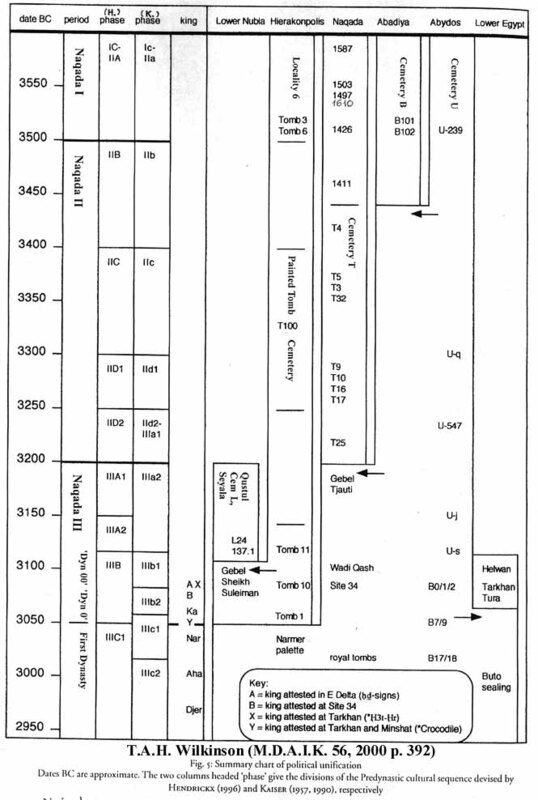 Uruk V-IVa = c. 3500-3050 BC) that these interactions became regular. In this period Egypt was undergoing a profound structural change, for the "Gerzean" or "Naqada" culture spread in the Memphite region and Delta. Independently from the reason, we can guess that trade was one of the chief factors which brought Upper Egyptians involvement in Lower Egypt, thus substituting the local inhabitants and culture into the Southern Palestine commercial relations. The evidence of serekhs diffusion in Late Predyn. Delta and EB IB Canaan is certainly an important clue about how developed must have been the Egyptian administrative organization at that time. But if we are not able -also through other paths- to ask more general questions, the evidence of serekhs distribution will turn out to be, taken by itself, somewhat sterile in the discussions about the origin of the state, although remaining of unlimited importance in other respects. Archaeologists are often forced to proceed by inductive methods (rather than with deductive ones), even if it can quite seem like composing a puzzle without having a reference picture of what it will look like at the end of the game. The earliest royal names did probably appear in order to establish the ownership of certain valuable goods, which were the object of long distance trade. The same pattern was at the origin of the earliest s., which were marked on the vessels to generically indicate that the goods they contained were 'royal property'. At that time there was already a way to indicate the name of distinct places and individuals by means of a developed code of signs which rendered both the phonemic aspect and the semantic category of what was written. It must have naturally followed, at a certain point, identifying the mark of royal ownership with the actual reigning ruler's name itself, and this was achieved personalising the s. by the association of the royal building (or whichever it represented) with the name of its owner. Early in Naqada III Egypt, at the time of the oldest ascertained royal names, writing was already developed and used for different purposes. But for more remote ages, the question of the origin of s. and royal names melts with the thorny problem of the invention of writing in Egypt. Some time before true writing, there already existed a set of conventions apt to represents the external reality such as animals and humans, plants, boats, water, mountains, shrines, houses and smaller objects (weapons, traps, emblems, pelts...). As these elements of the environment were becoming more and more frequently the subjects of bidimensional representations, the way to draw them tended towards standardization. The 'codification' of a series of rules to portrait reality occurred well before the similar process which later involved the hieroglyphs signs elaboration. 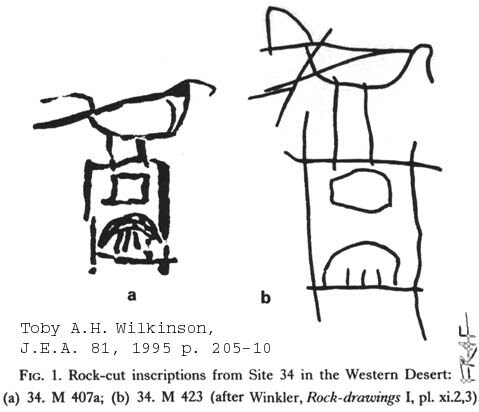 It is noticeable that the canons adopted to draw the first hieroglyphs, were mostly the same as those applied in the scenes represented on vessels and other s. In some cases these conventions remount to Naqada I (C-ware paintings), but in many others they follow the later Naqada II-III 'parameters' and style (or they were re-arranged anew). At a certain moment, the representation of what was observed, started to be complemented (or even substituted) by the representation of a meaning, a symbol, a sort of graphical metaphor . This must have occurred both in the sphere of pictured scenes and in that of the use of graphic signs: a relevant individual could be portrayed on an object by indicating his figure; later a name-label, pictographically indicating what his personal name was, could be applied to the image of that individual; then, with the homophony and rebus principles, a meaning could be conveyed by one or more (logographic or phonetic) signs not directly related to what they pictured. The same would be for places and other names and, much later, for fixing complex expressions and concepts on any material. But, in presence of isolated glyphs, as those carved on Naqada II artifacts, it becomes very difficult to demonstrate their function as proto-writing and their meaning as proper names. 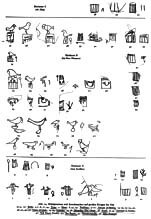 In mid-late Naqada II, despite several indications that seem to show the transition which led to the developed writing system known on the objects from tomb U-j, no certain writing (thus no name) has been identified. But it is evident that the known carvings and painting on various objects types, were by no means purely decorative embellishments (see above). Particular motifs on Gerzean sealings, vessels, knife handles and palettes could prove to be onomastic indications (either personal names, gods' names, or clans' and place names) which would therefore attest that the first sporadical use of a proto-writing system arose before the state society, thus out of its subsystems' organizative needs. Conversely, whatever the conclusions may be, it must be admitted that only the transformation of the Egyptian chiefdom/ village communities into (proto-) states did produce the urges which prompted the first forms of numerical notations and of complex writing systems. As K. Bard (1992) concluded: "Early writing developed in Egypt, then, to serve the state: for justifying its political organization, and for facilitating its economic, administrative and religious control". : General Bibliography on State Origin: M.A. Hoffman, Egypt before... 1979; B. Trigger, The Rise..., 1983; B.J. Kemp, Anatomy..., 1989; W. Kaiser, MDAIK 46, 1990; id., GM 149, 1995; K. Bard: JAA 11, 1992; id., JFA 21, 1994; id. with Carneriro, CRIPEL 11, 1989; id., with Rodolfo Fattovich, The Early Pharaohs: State formation and Ideology in Ancient Egypt, n.p. ; R. Fattovich, Definizione dei complessi culturali dell' Egitto predinastico e loro rapporti reciproci, in: Africa 28, 1973, 257-89; id., Remarks on the dynamics of State Formation in ancient Egypt, in: Dostal (ed. ), On Social Evolution, 1984, 29-78; C. Kohler, GM 147, 1995; T. Von der Way, MDAIK 47, 1991; F. Hassan, JWP 2, 1988; id., WA 29:1, 1997; C.E. Guksch, Ethnological models and processes of state formation..., in: GM 125, 1991, 37-50; A. Perez-Largacha, CRIPEL 18, 1996; M. Campagno, CCdE 5, 2003, 23-34; id., GM 188, 2002, 49-60; id., in press, abstract; A. Krol, in press, abstract. Also see the EEF archives: cf. topics of 'Unification' (Nov 1998, May 1999), 'Nomes and Protostates' (Sept. 2002) and my own page here. For Naqada IIIA and IIIB history see the text and relative bibliographies of my pages of "Dynasty 00" and Dynasty 0 respectively. : 'Serekh' can indicate either the only Ka-name + niched building or the whole compound of this latter plus the falcon atop of it. The adoption of the term s. is undoubtedly not seldom an improper short-cut, when it is applied to royal names of L.P.: in this period these insignia often display a different formal structure and may have divergent ideological bases and shared symbolism than the dynastic ones, which context the term is generally used for. 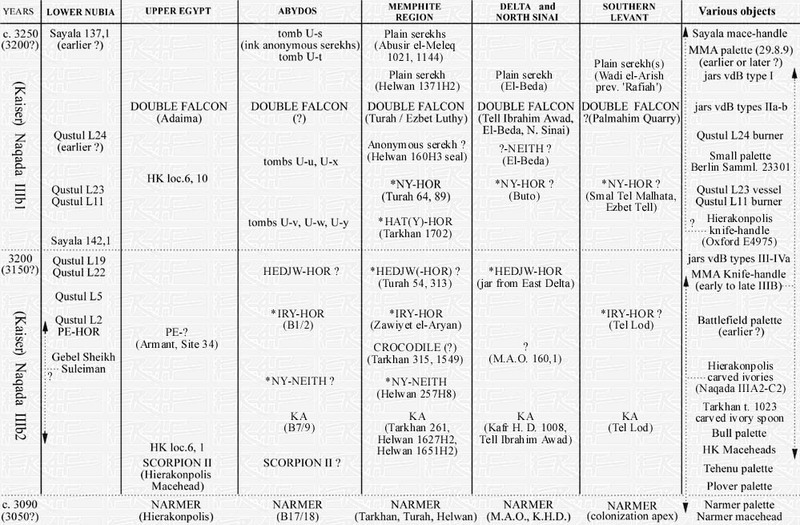 It must also be stressed that the falcon is almost universally considered to represent Horus (Hrw) since the earliest s., but Barta (1969) has also argued for an eventual generic designation of the bird as bjk (hawk), reading s. as "Falcon of the (royal) Palace". Contrarily to the evidence known for 2nd Dyn. 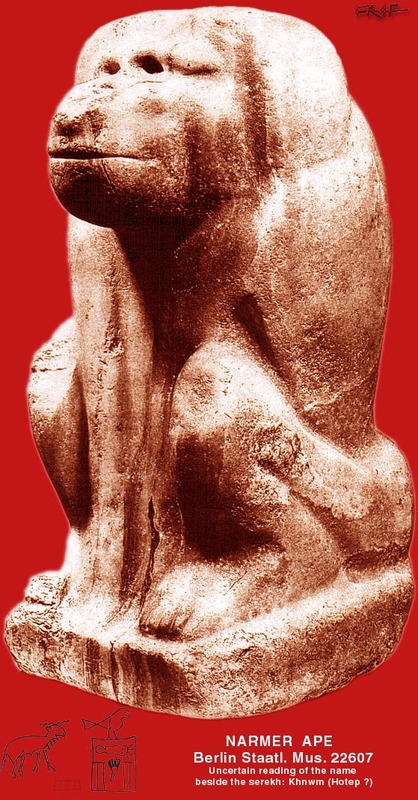 Peribsen and Khasekhemwy, no L.P. serekh is known to be composed with a surmounting protector god different than the falcon: the example on the seal impression from Tarkhan tomb 414 (Narmer reign) is unlikely a bull-head topped serekh, rather the temple of Sobek (J.D. Degreef, pers. comm.) in the nearby Fayyum area [see S. Donadoni, L'Arte nell' Antico Egitto (1981), 1994, p. 33, fig. 6b for a similar later representation of the Sobek temple Per-Nsr/Nw with a bucranium topped pole on it; for other L.P. bucrania façade shrines cf. Quibell, Hierakonpolis pt. 1, pl. 2 and 14]. G. Dreyer (in: Umm el-Qaab I, 180), has proposed that the falcon upon s. could have originated from a deified ruler who'd played a relevant role (perhaps as subjugator of the Delta peoples); this king would be Dreyer's king Scorpion (I)'s successor, Falcon I. However the question (which has parallels in the names of the roman Caesar and, perhaps, in the Luvian-Hittite Labarna), as well as the entire interpretation by Dreyer of certain -mostly animal- early hieroglyphic signs on Naqada III sources as predynastic royal names, all remain highly hypotetic and have already been the object of different critics (cf. F. Breyer and other authors cit. in n. 11). : On the (early) Horus names: H. Müller, Zur Formale Entwicklung der Titulatur der ägyptischen Könige, 1938; W. Barta, "Falke des Palastes" als ältester Königstitel, in: MDAIK 24, 1969, 51-57; id., in: ZAS 114, 1987, 105ff. ; P. Kaplony, Eine Schminkpalette von König Scorpion aus Abu 'Umuri (Untersuchung zur ältesten Horustitulatur), in: Orientalia 34, 1965, 132-167; id., Sechs Königsnamen der 1. Dynastie, in: Orientalia Suecana 7, 1956; id., Die Rollsiegel des Alten Reichs, 1977, 111ff. ; H. Goedicke, Zum Königskonzept der Thinitenzeit, in: SÄK 15, 1988, 123-41; J. von Beckerath, Handbuch der ägyptischen Königsnamen, (MAS 20) 1984, 11ff., 45ff., 169ff. ; W. Helck, Untersuchungen zur Thinitenzeit, 1987; R.H. Wilkinson, The Horus name and the form and significance of the Serekh in the Royal Egyptian Titulary, JSSEA 15, 1985, 98-104.
: General Bibliography on Early Serekhs: Wignall, GM 162, 1998; A. O’Brien, JARCE 33, 1996, 123-138; cf. G. Dreyer, MDAIK 55, 1999, 4f. ; for important considerations on the Delta origin of Serekhs/mudbrick architecture, with palace-façade features possibly reflecting the existence of relevant Maadi - Buto élites: Jimenez-Serrano, GM 183, 2001, 71ff., interestingly commented by E. van den Brink, GM 183, 2001, and disputed by S. Hendrickx, GM 184, 2001, 85-100, who proposes arguments for an independent Upper Egyptian origin of both the iconographical and architectural devices. An interesting, but unluckily fragmentary, representation of the lower part of a s. with a king (or statue ?) in front of him was found by Petrie in one of the tombs of the early temple/town area at Abydos (Petrie, Abydos, pt. 2, 1903, 27, pl. X.216). : For the word serekh cf. WB IV, 200,3-14; Faulkner, Concise Dictionary, 236-7. For the etymology of this word also cf. O'Brien, op. cit., 124; A. Gardiner, Egyptian Grammar (3rd ed. 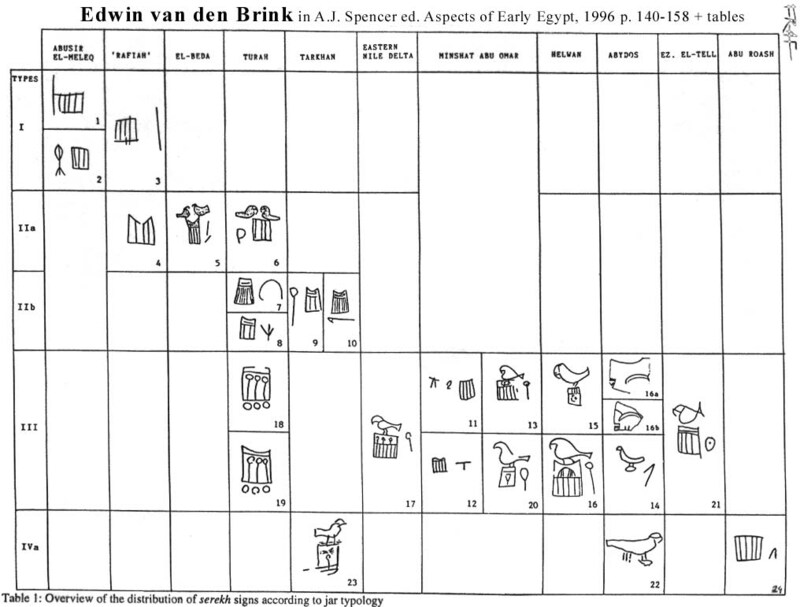 ), p. 72 (and Hieroglyphic sign-list: O33). The identification of the monarch with his abode, throne, seat or mat is a common metonymy in ancient (and in some recent) cultures: from the NK the Egyptian sovereign is Per-Aa (Pharaoh, Great House). At the end of the 1st Dynasty, some inscriptions commemorating the Heb Sed festivals of Horus Qa'a show his s. base drawn in the form of a throne instead than a palace façade (cf. J. Baines, Trone et dieu..., in: BSFE 118, 1990, 5-37); on early Egyptian Kingship cf. id., Origins of Egyptian Kingship, in: Silvermann- O'Connor (eds. ), Ancient Egyptian Kingship, 1995.
: In short, some mid-Second Dynasty kings are known by their Neswt-Bity names only (but this could depend on chance). The trend of cartouche names had already begun in the 2nd (Sened, Peribsen) and 3rd Dynasty (Nebka and Huni / Nswt-Hu). [6b]: A parallel for the relationship between falcon-god and king-name in the serekh-name can be found in the 1st and 2nd Dynasty kings' "Nebty-name", where the two goddesses are a common element of the Nsw-bity name (and part of the personal name itself) besides that (or rather than ?) already a title, e.g. Horus Semerkhet: Nswt-bity *Irj-Nebtj (or *Irj Netjer-Nebty); Horus Qa'a: Nswt-bity Qa a(w)-Nebty (instead of Nswt-bity/Nebty: Irj-Netjer; Nswt-bity/Nebty: Qa'a). Sen-Nebty and Shotep-Nebty are known on Qa'a labels where they're never preceded by the Nswt-bity title: therefore these two might either be two different Nebty titles of Horus Qa'a or his princes' names (cf. S-hotep-Nebty found on labels beside Qa'a's serekh and Hotepsekhemwy's Nswt-bity name Hotep-Nebty)]. : Foreign Near Eastern seals of early-mid Naqada II are chronologically followed by Egyptian seal impressions -also found on Palestinese imported jars- from Abydos cem. U (cf. 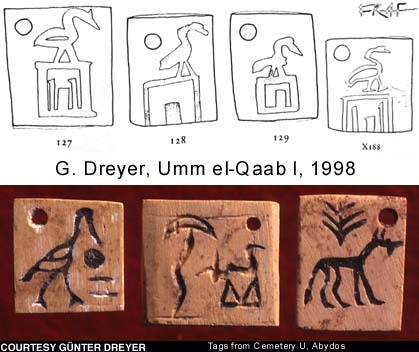 similar ones from Naqada and Abusir el Meleq) showing Egyptian motifs as geometric friezes, chaotic assemblages of animals and perhaps the earliest writing signs (personal or place names ?) datable to Naqada IId. Cf. U. Hartung, in: MDAIK 54, 1998, 187-217; id., in SAK 26 1998, 35-50; id. Umm el-Qaab II, 2002; cf. n.12. : The graffito was found near Wadi Halfa (2nd cataract) and the whole sandstone block is now at the Khartum Nat. Museum (Murnane, JNES 46, 1987; cf. Dynasty 0 webpage, pt. II and notes 68-71). It is mostly in relief, but some details (the s. falcon, the water sign at the feet of the captive, the two towns signs and the boat 'sail') are incised. The s. on the left hand of this panel is composed with three large niches below a punctured upper part. 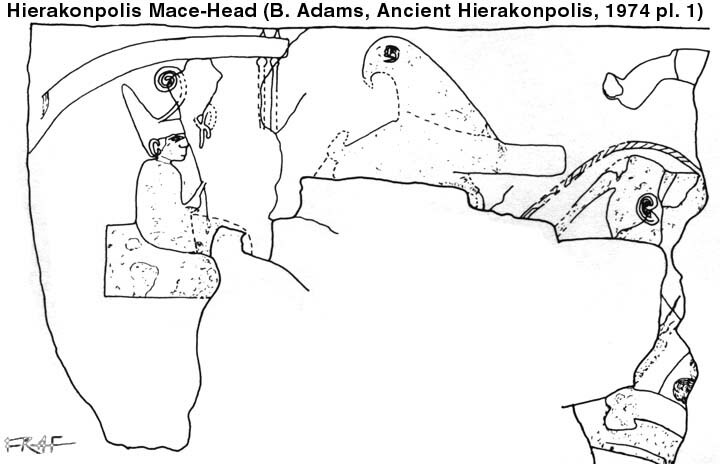 The alleged falcon's hindpart was partly over-incised by a horned mammal (antelope, dama deer, bovine ?) rough graffito. It is to be noted that the falcon is too small, too decentralised (on the left) and in too high a position than it should be if it really belonged to the serekh: this latter upper part seems to really end at the level where it is shown in the line drawing; so we must either suppose that the falcon had been erroneously drawn with oversized long legs and other incongruencies or that it belonged to a later inscription (than the main Dyn. 0 scene) which was in turn overincised with the gazelle-like animal. Just on the right of the falcon there is a "j" (feather) hieroglyph! The whole block is densely inscribed with lines and columns of Ptolemaic hieroglyphic inscriptions (omitted in the line drawing). Finally, it necessitates to remark that, although difficult to exactly date stylistically, the graffito must not be referred anymore to the reign of Horus-Djer (as it still happens) for it has been shown (by Murnane) that the *djer-sign was instead the body of the leftwards-facing antelope. : For early Naqada III serekhs 'lists' cf. the articles of W. Kaiser (1982), E.C.M. van den Brink (1996, 2001), S. Hendrickx (2001), A. Jiménez-Serrano (2001, 2003) quoted in the bibliography of the Corpus (see below in this page). For a discussions of the known sources of 'Dynasty 0' kings: F. Raffaele, Dynasty 0, in: S. Bickel-A. Loprieno (eds.) Aeg. Helvet. 17, 2003, 99-141.
: The motif of rosette/florette (or star, palm-tree) is not only encountered in the region of the southernmost three nomes of U.E. (as on the late Naqada IId-early IIIa Brooklyn Knife handle from Abu Zeidan, south of Edfu; the Scorpion macehead, Naqada IIIb2; perhaps the Metropolitan Museum knife handle). The Gebel Tarif knife handle and more unprovenanced objects were probably found in the Abydos-Dendera region: yet it is also very likely that Thinis and Nekhen élites/chiefs did exchange and present to each other the masterpieces their craftsmen fashioned (the similar style of animals skins on the Gebel Tarif ivory handle and on the Seyala golden mace-handle has already been noticed). See F. Raffaele, The Dynasty 0 page, part II, note 28. For the rosette/florette reading: H.S. Smith, in: Followers of Horus, 1992, 235-246.; Schott, Hieroglyphen 1950, 25.
: Cf. B. Kemp, in: CAJ 10:2, 2000; L. Baqué Manzano, in: BIFAO 102, 2002; (followed by A. Jimenez, in: Archéo-Nil 12, in press); F.A.K. Breyer, in: JEA 88, 2002, 53-65; J. Kahl, in: Archéo Nil 11, 2001; id., in: GM 192, 2003; id., in: CdE in press. The Gebel Tjauty tableau has given new vigour to the identification of a ruler whose name would be Scorpion (I) to be identified with the outstanding personage buried in Abydos cemetery U, tomb U-j. However it must be stressed that alternative theories have recently been proposed for the interpretation of both the mentioned graffito as well as the corpora of inscriptions from tomb U-j (mainly small incised bone/wood/ivory tags and ink signs on wavy handled jars) and those on the Towns palette and Min Colossi. Despite our omnipresent urge to extract historical informations from any source (as it was with regards to the so called 'monuments of Unification') it is criticizable that these early objects might have really contained any information about facts and events (B. Kemp, J. Baines and, more recently, K. Köhler, have pointed out the symbolic and nearly "philosophical" status of early Egyptian representations which, as also H. Asselberghs remarked in 1961, are more likely a vehicle of the èlites' ideology, beliefs, needs, psychology and traditions rather than cronicle-like narrations of real events). However I would not categorically exclude the possibility that some late Naqada II- early Naqada III representations could reflect or relate either to important facts happened at the time the representations were carved or to some which were still remembered by that time, thus having a (though relative) historical importance. 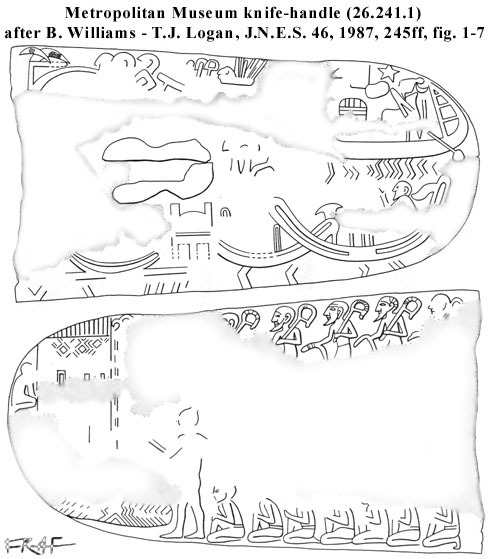 This would seem to be the case for the Gebel Tjauty graffito and perhaps for Narmer's reign scenes on the famous palette, the Abydos label and the ivory cylinder from Hierakonpolis (which all appear referring to more or less specifical campaigns against precise rather than idealised enemies; but this is questionable and yet unproven). All in all it seems sure that in the mind of Ancient Egyptians (in Predynastic as well as in Dynastic times), it was not the effective historicity, and historical truth or reliability of an event represented to be important, but the magical value (either positive / propitiatory or negative / apotropaic) and the very effect that the representation itself would have on the real World. Finally, about early royal names, it is still to be definitively proved that proper kings' names have already existed on artifacts and monuments dating before Naqada IIIB, including the much renown 'Scorpion' (I)'s one (for convincing alternative hypotheses -toponyms or gods' names- cf. Breyer's and Kahl's papers quoted above in this note). : On Egyptian writing in the second half of the IVth Millennium see: J. Kahl, op. cit., 2001; id., Das System der Agyptischen Hieroglypheninschrift, 1994 (esp. p.143-163); id., Della scrittura geroglifica arcaica, SEAP 16, 1997, 5-23; G. Dreyer, Umm el-Qaab I, 1998; U. Hartung, op. cit. (cf. note 7); R.M. Boehmer, Das Rollsiegel im prädynastischen Ägypten, in: A.A. 4, 1974, 495-514; W. Kaiser, in: MDAIK 46, 1990, 287-299; H.S. Smith, The Making of Egypt, in: Friedman - Adams (eds. ), The Followers of Horus, 1992, 235-246; K. Bard, Origins of Egyptian Writing, ibid., 297-306; W.S. 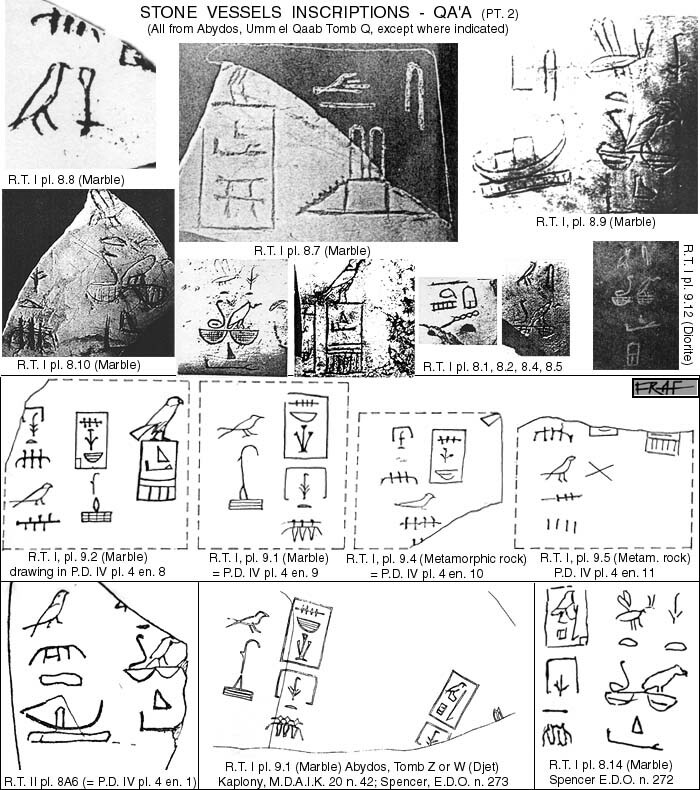 Arnett, The Predynastic Origin of Egyptian Hieroglyphs, 1982; J. Baines, Communication and Display..., in: Antiquity 63, 1989, 471-82; id., Scrittura e società nel più antico Egitto, in: Tiradritti (ed. ), Sesh. Lingue e scritture nell' Antico Egitto, 1999, 21-30; P. Vernus, La Naissance de l'Ecriture dans l'Egypte Ancienne, Archéo-Nil 3, 1993, 74-108.
: Cf. W.S. Smith, A History of Egyptian Sculpture and Painting in the Old Kingdom, 1946; Schäfer (Brunner-Traut / Baines), Principles of Egyptian Art, 1974; E. Iversen, Canon and Proportions in Egyptian Art, 1975. Also cf. R. Tefnin, Image et histoire. Reflections sur l' usage documentaire de l' image..., in: CdE 54, 1979, 218-44; W. Davis, The Canonical Theory of Composition in Egyptian Art, in: GM 56, 1982, 9-26; J. Endrodi, "Figurative discourse" and "Communication" in the Emerging State of Egypt, in: GM 125, 1991, 21-36; E. Finkenstaedt, Regional Painting style in Prehistoric Egypt, ZAS 107, 1980, 116-120; id., in: JARCE 18, 1981, 7-10; J. Baines, On the Status and Purposes of Ancient Egyptian Art, CAJ 4/1, 1994, 67-94; H. Sourouzian, Concordances et écartes..., in, N. Grimal (ed. ), Les Critères de datation stylistiques..., 1998 (BdE 120), 305-352.
: E.g. from a scene which represented a particular hippopotamus hunt (pseudo-chronicle of an event), to one in which an ideal hunt is shown, which is full of symbolic, ritual, divinatory, propitiatory or apotropaic meanings (symbolic meta-narrative). Of course there must have existed no rigid difference between the two forms of expression and it's often hard to interpret the scenes as belonging to one of the two groups. A graffito which aimed to represent a mythical event -thus one thought to have really happened- might have shared parts of both the narrative principles: whether the chronicle-like or the metaphorical, symbolical one. The problem of the interpretation of the oldest attestations of Egyptian writing is roughly similar to the one just outlined: we have some difficulties in understanding when a sign represents itself (pictogram, semogram) and when a different thing (phoneme, logogram). : Therefore we can hypothesize that rude forms of onomastic-notations occurred well before the Egyptian society accomplished its transformation into what we call, in an evolutionist terminology, a state. This latter social level was highly benefited by the different uses of writing, which became one of the most important features of any state (world-wide). Yet the full capability of writing to translate any kind of thought (by extended sentences), was achieved only in the 2nd and 3rd Dynasty and the most efficient and developed use occurred since the 5th/6th Dynasty, a millennium after the Abydos t. U-j inscriptions. It is nonetheless certain that early Naqada III inscriptions are already a mixed (phonetic, logographic, pictographic) and thus improved form, which must have had a longer history and a probale (c. 200 years) older origin, back to late Naqada II. Even if it was not the state to inspire writing invention, it was certainly the state to require and guide the improvement and evolution of this ingenious tool from a limited notation-system towards an elaborate form similar to the one we currently avail. - RAF : Francesco Raffaele, "Dynasty 0", in: S. Bickel - A. Loprieno (eds. ), Basel Egyptology Prize 1 (Aegyptiaca Helvetica 17), 2003, 99-141, plate of p. 141. - A. Jiménez-Serrano, Chronology and Local Traditions: the Representation of Power and the Royal Name in the Late Predynastic period, in: Archéo-Nil 12, 2003 (in press). Note that some of these Naqada IIIb1-2 rulers might have reigned contemporarily. The list of Serekhs of Ka and Narmer from Abydos cemetery B is incomplete. This table will be perpetually updated (also cf. the page of DYNASTY 0: HERE). Dreyer, Umm el Qa'ab I, 1998 n. 127-129, X188 "Palastfassade" shrines (s. prototypes ?). < °- Scorpion > ? Hendrickx, Friedman, Darnell, 2002 Are the F. and the scorpion below it in a direct relation to eachother (as in later KN) ? Uncertain reading of N hierogl. and missing F.
Sign for day/sun right of the s.
Jiménez Serrano, GM 180, 81 ff Jiménez Serrano, interprets this serekh and the human figure with raised hands beside it, as the royal name of Horus Ka. (Steatite). T-shaped mark on the right of the s.
Williams, Qustul cem L, pl. 34; JKQ 216 Naqada IIIa ? - Rosette left of the s.
T. Wilkinson, J.E.A. 81, 205-210 It is not clear whether the lower sign is the palace façade or a further hieroglyph. Jimenez Serrano (in: BAEDE 10, 2000, 38) proposes the reading Hor Hwt Nwb. Uncertain chronol. position: once said to be of Djer, then dated by Murnane to Dynasty 0. IMO the f. might not belong to the punct. s.
RT II pl. 55.5; WKM 14; JKQ 24 potmark ? - Iry Hor Abydos B cem. Gilroy, GM 180 fig. 3, pl. 2a Royal Ontario Museum, Petrie's excav. Gilroy, GM 180 fig. 4, pl. 2b Royal Ontario Museum, Petrie's excav. < -[°] Iry [Hor] > ? Hwt Hor / Ny Hor ? VDBf 119 (Ovoid jar); Possibly KN: Nj-Hor, Hwt-Hor, Ka, Hor Aha; if not KN: Hwt-domain, Hathor ? Gilroy, GM 180 fig. 2, pl. 1b Only a leg of the F. is visible on the s.
WKM 24; VDBc 15 (inverted); VDBf 28 Republished by E. van den Brink - C. Köhler, in: GM 187, 2002, 59ff., fig. 1.3, 2.3, pl. 3 (1627 H2); fig. 1.4, 2.4, pl. 4 (1651 H2). cf. Hendrickx GM 184, 2001, 85ff. The Falcon is left of the s.
The F. is similar to Nj-Neith's one; yet an eventual s. should be below it, not on the right. Kaplony, IAF II p. 1090, advanced these were king Scorpion's serekhs; Petrie erroneously drew the name in the serekh from T. 315 as Ka. °*- Scorpion Hierakonpolis Main Dep. Narmer Abydos B cem. ??? ° Nar(mer) Abydos B cem. ° Nar(mer) P East Delta unprov. Dreyer, MDAIK 55, 1999, 1ff. ; VDBf 30 The NAR sign is atop a kind of plain s.
IAF III, 34; JKQ 105 Narmer's estate ? IAF III, 35a; 106 Narmer's estate ? IAF III, 35b; JKQ 107 Narmer's estate ? 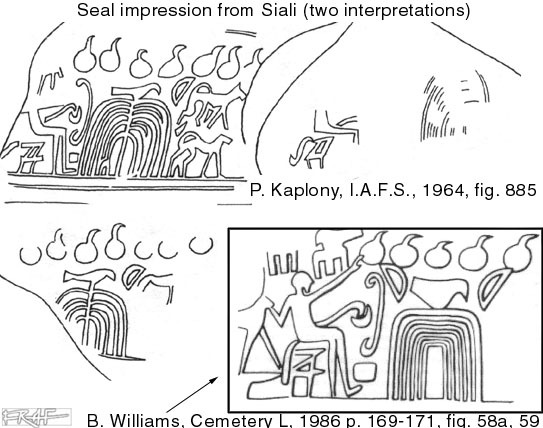 Schulman, Atiqot 11, 22ff; WKM 42; VDBf 80 F. tail partly visible; possibly a later s.
< ° Nar(mer)? > ? cf. Hendrickx GM 184, 2001. ° Narmer, - Narmer Hierakonpolis Main Dep. °- Narmer Hierakonpolis Main Dep.